Stockpile is a website and mobile app (Android and iOS) that basically serves as an online brokerage firm. You can invest in thousands of major US stocks like Google, Apple, Amazon, Tesla and Facebook to name a few. You can also invest in ETFs, which anyone who reads this blog knows I love, as well as ADRs for foreign stocks, and even gold. Easily link your bank account to your Stockpile account to facilitate the transfer of funds. Need more convenience? You can even buy stock with a credit or debit card! Trades are 99¢ and there are no re-occurring fees or account minimums. You can reinvest any dividends with no fee. If you used to have a LOYAL3 account and ended up being transferred to FolioFirst, it’s super easy to migrate to Stockpile. You won’t have to pay $5 a month just to have a brokerage account like you do at FolioFirst. They will actually give you 5$ free stock if you refer friends or family members to Stockpile. If you’re investing with other online brokerages, be sure to check with them about incentives and help with moving. You need a US address and a Social Security Number (SSN) to open an individual account, or a custodial account so an adult can manage investments for someone under 18. Why do they need you SSN? The Patriot Act requires it in order to verify your identity and to prevent money laundering and the funding of terrorism through the stock market. Your personal information is obviously handled with the utmost security as with any other financial institution. There are plans in the works to offer the service in other countries later this year. All of these features are more or less similar to what you get with other online brokerage firms you’ve seen, but Stockpile has 2 truly innovative features that separate them from the others. One of the biggest barriers to owning some of the big name stocks is their high price. Want to buy some Amazon stock? As of today, a single share will cost you $964.17!!! The average millennial or low income earner doesn’t have that kind of money and therefore are discouraged from taking part in the stock market. It’s no secret that the key to accumulating wealth is investing early and often over a long period of time. Instead of having to buy a whole share of that expensive stock, Stockpile lets you buy fractional shares. How does that work? Say you want to buy a stock that costs $1000 per share, but you only have $100. Stockpile lets you buy 1/10th of a share. If the stock happens to pay a dividend, then you’ll earn 1/10th of the dividend. No longer do you have to sit on the sidelines while you save up enough money. Start building a modest portfolio today. You can buy the big names with a little bit to start, and then build from there. The other innovation Stockpile brings to market is the ability to easily gift ownership of a stock to others. When I was a kid, I remember my grandparents giving me and my bother actual share certificates in companies to be used for our education. This was likely a painful process for them when you consider they had to transfer funds to a broker, who then purchased the stock, then had to physically mail the certificate. Stockpile uses fintech to make this process so much easier. With Stockpile, you can purchase an e-gift card at https://gifts.stockpile.com/ or at thousands of physical store locations like Kmart, Lowes, and Toys R Us to name a few. The gift can be for an individual stock, but you can also get multi-company cards that list a bunch of stocks the recipient can chose from. There are also cards for exchanges like the NASDAQ, and the S&P 500. Choose a gift card good for $25, $50, or $100 of stock. The total purchase price is a little higher ($29.95, $56.95, or $107.95) to cover credit card fees, trading commission, and other costs so the recipient doesn’t have to pay anything when they redeem. Once they redeem, every stock trade in their account is just 99¢! If the recipient is under 18, they can sign up for a custodial account mentioned above with an adult and then track their investments with their own login. If they want to make trades, they get to place the trade on their own, and it automatically goes to Mom or Dad for approval. This ability to easily give a gift to a child, grandchild, nieces, nephews or anyone for that matter is a game changer. Not only are you allowing them to start building wealth, but you’re teaching them how to be an investor which will pay off in the long run. If the recipient wants a different stock, they can simply pick another one. 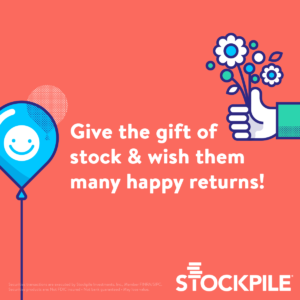 Get a free $5 from Stockpile to buy your first stock! Stockpile is passionate about making investing accessible to everyone. To that end they have some robust learning material on their website to help new investors learn the lingo and basics with a series of cheat sheets. Stockpile serves as a great online discount brokerage, but it differentiates itself by making the stock market more accessible. No longer is a lack of funds a barrier to entry. Investors with as little as $25 can buy stocks in big name companies. Don’t have $25? Go down to Kmart and buy a gift card with your credit card. That’s the kind of consumer debt I can get behind! Throw in the ability to easily gift stock to others, and I think they have a great value proposition. I welcome your questions or comments, and please feel free to share your opinions in the comments section below. Click here to see reviews of other popular fintech products.